Blimey! What's going on here? The Moonlander, built by Yuri Landman for Lee Ranaldo of Sonic Youth, is an electric guitar with an extra set of 12 sympathetic strings. While guitars with sympathetic strings are nothing new (e.g. the Coral Sitar) this is the first guitar I've seen to employ a double-deckered headstock. 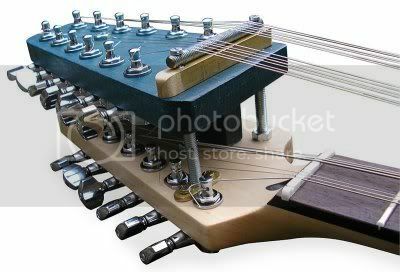 (Note, by the way, in the headstock photo the alternative stringing of the six strings on the neck). And if you think that's mad, check out some of Yuri Landman's other creations, such as the Moodswinger. Take a look at these highly intriguing pages while you can before Wikipedia goes and deletes them, although there's more to be found at www.hypercustom.com. Outlaws' Guitarist Dies at 55: Hughie Thomasson, a founding member of the legendary Southern Rock band The Outlaws, passed away at his home in Brooksville, Florida late Sunday evening. Thomasson, 55, died of a heart attack in his sleep. Whitesnake Guitarist Uncovers His Own Imposter: Former Whitesnake guitarist Mel Galley has personally uncovered a man who has been posing as him. Perhaps he should have asked him to demonstrate his guitar playing skills. Led Zeppelin to Rock with Sound of Craftsman's Guitars: John Paul Jones will be playing new basses built by Hugh Manson of Exeter at the forthcoming Led Zeppelin one-off reunuion show at London's O2 centre later this year. Guitar fans are bursting with love for the now legendary Gibson Les Paul Standard "Burst" sunburst finish. 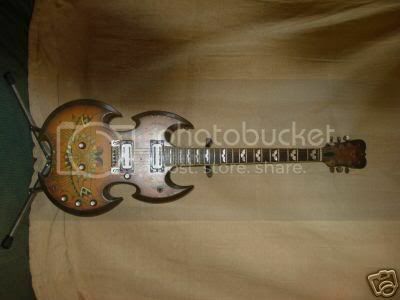 Nice article on vintage guitar collecting from Virginia's dailypress.com. 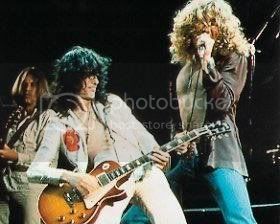 Led Zeppelin to confirm reunion: Rock group Led Zeppelin are expected to announce a one-off reunion concert at a press conference on Wednesday. 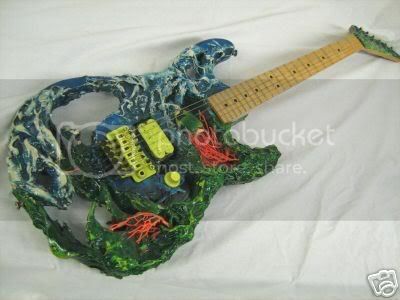 The Guitarz Chamber of Horrors! 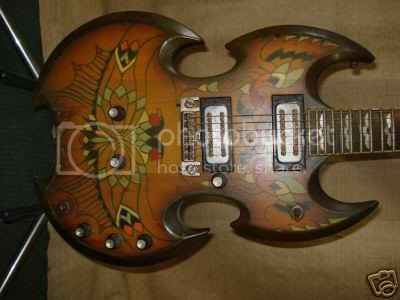 If you enjoyed yesterday's Jerrycan guitar, then you might also enjoy today's little freak show that I have put together from some of the weirder guitars currently on sale on eBay. 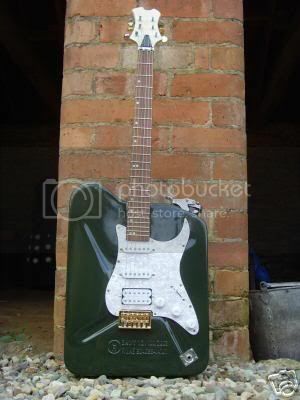 First up, we have a one-off guitar built by legendary British luthier John Birch for Dave Hill of Slade, and apparently used by Hill on various TV appearances (although I confess I can't remember having seen it before). Hurry! The auction ends in two days time. Buy it now for £25,000! (More on Slade's gear here). 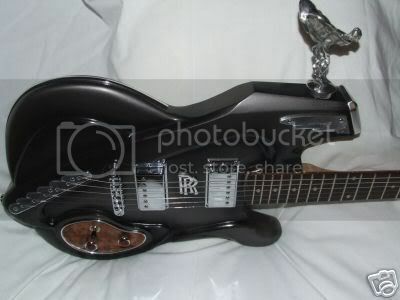 Now feast your eyes upon this - a one-off Rolls Royce themed guitar, complete with flying lady hood ornament! But aren't Rolls Royces supposed to be elegant? Starting bid is £700. Buy it for your chauffeur. Finally, this abomination is supposedly someone's idea of a work of art. 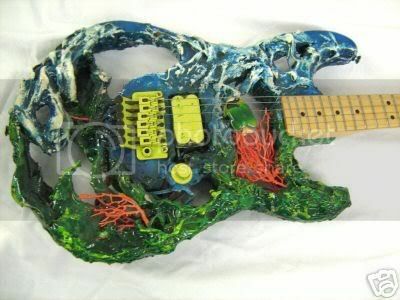 Presenting the Charvel "Coral Reef" guitar, which would probably look a whole lot better at the bottom of the sea. Buy it now for £999 from this infamous German seller, well-known for their over-inflated prices on complete pieces of crap. Oh, and don't try any Pete Townshend style windmilling on this - you'll likely impale your hand on a spiky bit. Lovingly hand-crafted from a 20-litre Land Rover jerrycan and some el cheapo guitar parts, this tin-can behemoth could be yours for £135 on eBay! Need more convincing? See it in action on YouTube. Blimey! MYTHBUSTERS - Was Hendrix Ambidextrous? Most of us are agreed that Jimi Hendrix was a phenomenal guitar player; many would argue that he was the greatest guitarist the world has ever seen. Even his detractors will grudgingly admit that he was ahead of his time and was pushing the boundaries of guitar playing. I think it would be fair to say that the man had talent. However, there is one much-quoted talent that I'd like to take issue with. It's often been said that Hendrix was ambidextrous, but I have never seen any film footage or photographs to confirm this. Searching the web I find articles that claim that he could play the guitar right-handed, but preferred the play it left-handed. But where is the proof that he ever played right-handed? I have never seen any. I wonder if something has been lost in translation over the years? 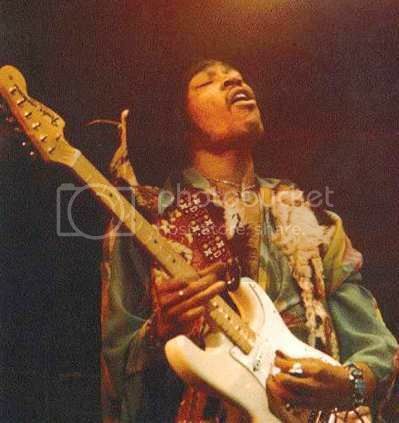 We know that Hendrix could play guitars that had been strung for either a left-handed or a right-handed player. I recall an article in a guitar magazine, many years ago, which was looking at a Martin acoustic guitar that Hendrix had used and that had always been strung right-handed. Indeed, to have strung it left-handed would have placed tensions on the top of the guitar that the internal bracing was not designed to withstand. Also, in his autobiography, One Train Later, Police guitarist Andy Summers talks about how he once jammed in the studio with Hendrix playing bass. After a while Hendrix asked him if they could swap over and if he could play the guitar, so they swapped instruments. This would imply that they were each using the same guitars, so they must have been strung the same way (I'm assuming right-handed in this instance). Further to this, Hendrix was known to have occasionally played a Hagstrom 8-string bass on some of the 1967 sessions. (See pic). It's doubtful that this bass was converted for left-handed stringing - especially if Noel Redding also played it. So, my guess is that the truth behind this myth is that Hendrix played guitars strung for both left and right-handed playing, and not that he actually ever played right-handed. The Muse Who Made the Guitars Gently Weep: New York Times book review of Pattie Boyd's "Wonderful Tonight: George Harrison, Eric Clapton, and Me". Pattie was the "muse" behind George Harrison’s "Something", Eric Clapton’s "Layla" and "Bell Bottom Blues". Heritage Guitar owners in negotiations to sell company: The men who started their own guitar company after Gibson Guitar Corp left Kalamazoo for pastures new in Nashville in 1984 have temporarily halted operations and are in negotiations to sell Heritage Guitar Inc.